Thanks for sharing the info, brother !!! Hey guys, here's an interview I did a month ago before the show in Milan that just got published, enjoy it! very nice Interview - good questions and detailed answers. Thanks for the interviews! They are all very interesting! @Max: sorry to interrupt you once more but are you actually watching "Der Dunkle Parabelritter" (a german YouTuber, who talks mostly about metal and did the 2nd interview) or did you just found the video? I was looking for Interviews on the net. Often you just miss them - that's why I like this post! I do not follow any youtuber. I do not even have a Facebook Account or anything alike. Just curious about hearing any news from BG. sciacallo010 wrote: Hey guys, here's an interview I did a month ago before the show in Milan that just got published, enjoy it! In this interview Marcus mentioned CD3 of Live album (old one, from 2003) that was available for download. I don't remember I listened to this outtakes. Are they still available somewhere? Thank you There are really some funny moments, like Hansi singing na-na-na when he forgot the lyrics, or him starting the chorus in Valhalla too early, and this solo guitar mess in The Script For My Requiem. In Saint Petersburg yesterday he introduced "Banish From Sanctuary" in this way: "...Of course I had a shot of vodka before the show, and I think I drank theirs (points at Marcus and Andre) as well... Not trying vodka in Russia is like being BANISHED FROM SANCTUARY!!!" and there we go. Oh man, Dragonfly - can you translate any of the others? That's great. Or was it in English already? I didn't listen to them all. Ryu wrote: Oh man, Dragonfly - can you translate any of the others? That's great. Or was it in English already? I didn't listen to them all. Oh, and after Hansi says he had some vodka before the show he starts singing and messes up some lyrics a little bit (instead of "I hear the hangman coming..." he repeats "I left the way of heaven..."). Best proof he wasn't telling lies. Yes, it was in English. He tried his best with the words like "привет" and "вы лучшие!" ("Hi" and "You're the best!" respectively) and it was sweet. Hansi: I hope you still know us. We do so from the last time! <pointing at one guy in the audience> but you weren't standing over there, you were standing more to the left. But you can stay there else it would be like Banished from sanctuary. Great! There's nothing wrong with Hansi's sense of humour, I've always liked it. Over the last few years many bands have been doing tours playing in full some classical albums, or with special setlists (for example only old songs), often with old band members as guests; have you ever though to do something like that, maybe with Thomen as guest? First of all I don’t like the concept of bands playing full albums, because for me a gig is all about the elements of surprise, I don’t want to know what is going to be played in advance, I don’t like it. For example I’ve been to an Orphaned Land gig last year where they played the whole Mabool album, but they didn’t played it from the beginning to the end, they played all song but in between there were new songs…that was fine, but a band coming on stage playing the first song from whatever album and going on til the end is boring in my opinion, that’s my concept of gigs. People has been asking if we might play Nightfall completely at some point, of course there’s the possibility but I don’t really see it happening at the moment and definitely don’t see it in a tour context, if we’ll ever do something it will be in some special occasion, maybe Blind Guardian Open Air, but we have no plan for something like this. I find it really surprising that the underlined and italic phrase was actually spoken by a bandmember since BG themselves have had a history of quite unsurprising setlists. Even this tour: I believe that for the 4th consecutive tour they are playing Nightfall at #3-4, always with the same introduction. I'm glad they dropped Welcome To Dying, which had been the 2nd song in basically all the concerts during the last 10 years or so. You know Fly is coming either immediately after Nightfall or with one song in between. You know they will play 2 encores, with one of them containing a long epic (ATTWS/WoT and now also Sacred), and immediately after that there will be The Bards Song - In The Forest. The last song of the concert will always be Mirror Mirror. Before this tour you were basically always assured to hear at least 4-5 songs from IFTOS, with the titletrack always being somewhere in one of the encores. New songs were always 2 or 3, and always at about the same positions in the setlist, like now you know they will start with The Ninth Wave, putting Prophecies at #6, Miracle Machine will be played together with another ballad in an acoustic miniset (awesome idea btw), and Twilight of the Gods will be the 2nd song of the 1st encore. The one in charge of the setlists is Hansi who choose them depending on how is his voice; some songs have to be there because the fans "pretend" them (I must say I found really annoying listening to people in Milan screaming "Valhalla, Valhalla!" and "Majesty, Majesty!" after every single damn song until they played them) . Something like playing an album in full would surely be decided by the whole band and here's where Marcus's answer would apply most. I´ve thought about trying to translate the whole thing because I think it´s very interesting and contains information all Fans probably want to know but it´s very, very long and I have no special qualifications on translating from german to english (just my regular school english). Can you tell us in short what he says? Of course not every singe word, but just a summary of the most important and interesting things he says. Sure, no hurry man, you are already doing us a great favor! there is nothing special, he asks nearly the same questions as every interviewer. In his case it's really hard because he seems to be an die hard fan. There are better and far more informativ and personal interviews made by the one posted above. I think I probably can´t agree with you. I actually think that there are quite interesting questions and I actually like the fact that the interviewer is a fan, but I can understand that you have problems with that. But I guess everyone has a different opinion. i have no problem that he is a fan, i have a problem with calling himself a fan and then not knowing some stuff which is quite common knowledge of a regular fan or can be found easily on the net. I like his style but his questions were like those always asked so many times. others just have some mins for an interview them (and seem to be more prepared). Okay I can agree with that. So that´s definitely a better one, althoug there are some standard-questions (or however you call them) too (e.g. the one about the choirs). So is there still a need for a short version of the other one or is what Traveller in Time posted enough? I think you already have written down most of the things that I wanted to say. And I think I found out, what I like so much about this interview. It´s the whole atmosphere. Sometimes it feels more like small talk and I think it´s very personal. Damn, i feared it but i really wondered about how Hansi could stand so many concerts and the nimmediatly going back to the studio. But i think it's wise that Hansi saves his voice and isn't doing any vocals for the orchestra project. Is he wearing a NiME Shirt? So André is still playing a priest, it is nice to know since his reply on Reddit got me confused: "If i would dress up for a convention, i would choose a dwarfen outfit, cause i like the plain warrior, who is fighting in melee combat. -AO"
I have always respected the straightforward way Marcus answers the questions. PJ's Hobbit is pretty horrible as something that has LotR standards to match, but still is not too bad if viewed as an unrelated fantasy movie. Anyone willing to make a translation? 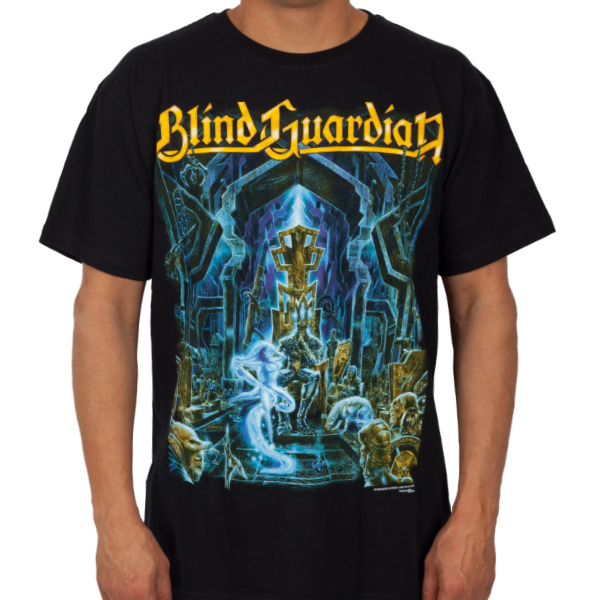 Blind Guardian zocken Rayman Legends: Heavy Metal Gaming! Interview with Marcus from Helsinki, uploaded on 22.06.2015. Some news about their time schedule. Anyone else waiting for what Santa Guardian will bring this season? yeah i really doubt in their schedule. In summer they will do festivals and maybe some gigs in north america, canada, then producing the live album (listening to all the recordings?) and finishing the orchestra album? If I get another show on this tour, the live album, the orchestral album, and another regular album by 2020, I'll call it a good deal whatever the finer details of that schedule are. "What got you in to Tolkien?" "Why do you like fantasy?" "Why do you like music?" Merry Christmas (or happy holidays) to all Forumers.